I want to start this race report with a bit of a disclaimer before you get too invested in reading this write up. This is not a race report in the traditional sense. 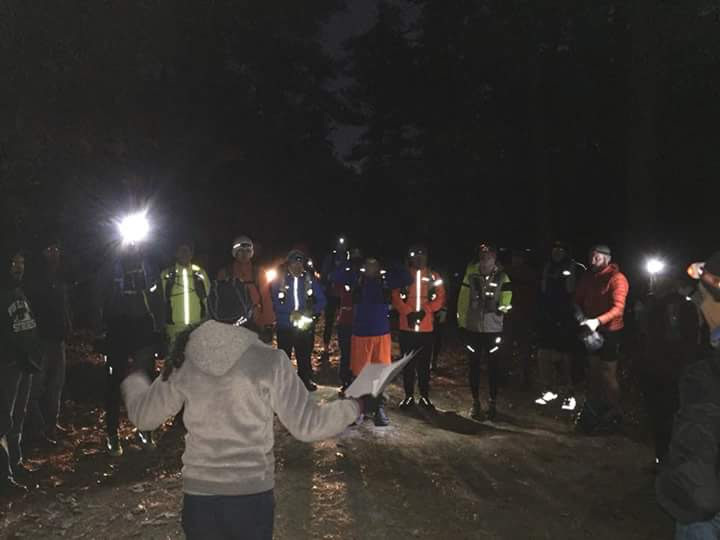 It is more of a report of my experience leading up to and completing the Batona 50 miler. If you are more interested in a traditional race report, check out my report from last year’s Batona 50. Otherwise, please read on. This was my second consecutive year running the Batona 50 miler and for whatever reason, I was not as excited about running it as much this year as I was last year. There could be many reasons to explain this. Maybe it was because it was the last ultra of the year I was registered for, maybe it was because I already achieved all of my running goals for 2017, or maybe I was just feeling a bit burnt out on running in general after running two 100 milers in the three months leading up to the Batona. The last of these explanations is probably the best answer for my lack of enthusiasm. I had run Eastern States 100 in August and then ran the Tesla Hertz 100 miler in October. With little down time between the two 100 milers and even less time between Tesla Hertz and Batona, I had little time for recovery or training. This was my first method of sabotaging my day at the Batona: setting myself up for failure by not allowing the time necessary for the physical and mental recuperation that is needed (for me anyway) after a 100 mile event. I’m no expert, but running 100 miles changes you a bit physically and mentally afterwards. The body needs to repair itself and the mind, I haven’t quite figured it out yet, but it seems to need to acclimate itself back to the real world. After maintaining the physical effort for such a long period and the intense mental focus during that extended time, I think some rest is probably the best thing for the mind and body. I did my best to rest and recover, but I felt the need to pick up training again to prepare for the Batona 50. I was back to doing some short and medium distance training runs, but never felt really motivated. I was battling some plantar fasciitis issues which came and went making every run feel like a gamble. 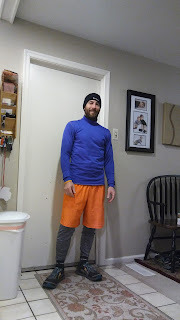 Then I came down with a nasty cold about the time I intended to get my one long run in before the Batona. What I had intended to be an easy paced 25 miler ended up being an 11 mile struggle. It was one of those runs where you don’t feel like going out to run for whatever reason, but you force yourself to thinking that once you’re out you’ll start to enjoy it. This usually works for me, but being more sick than I had thought I was messed that plan up. With my throbbing sinus headache and my runny nose I suffered through 11 miles before I called it and said that it just wasn’t worth it. Not getting a single long run in to prepare for Batona had a huge impact on my confidence going into the run. The two weeks leading up to the run I had created and repeatedly told myself the mantra “I have no business running a 50 miler”. So I guess that’s my second method of sabotaging my run, allowing a negative mental outlook to develop and then going even further and nurturing it with a mantra. I hoped that my outlook would turn around as the race drew nearer and I became more excited for the opportunity to run, but it never happened. I went through my normal build up as the race date approached, checking the forecast and deciding how many layers to wear. The cold start predicted for the morning of the run didn’t help get me motivated. I enjoy some cool weather running, but a starting temperature in the low 20s with a high in the mid 30s is a little cooler than I prefer. Checking the forecast every couple days leading up to the run with little to no change led me to accept that this would certainly not be the most enjoyable 50 miler I’ve ever run and that I still had no business running a 50 miler at this time. Race morning came early. I got dressed, grabbed my stuff, and was out the door. As soon as I stepped out the door the cold hit me and I decided I had under dressed. 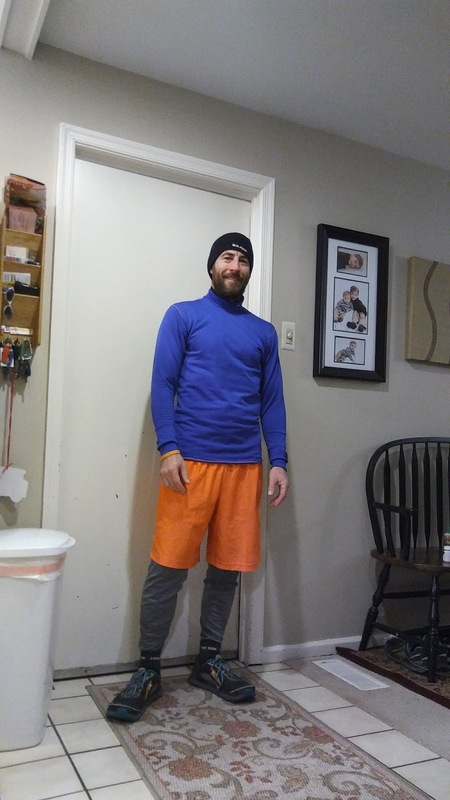 I ran back in and exchanged my outer layer long sleeve wick away shirt for my winter gear wick away long sleeve. Feeling good about that last minute decision I was enroute to the rendezvous parking lot near the finish of the race where everyone running the race carpools from to the start, 50 miles to the north. I followed my GPS which I had set the directions for the previous night until it led me to a dead end road, not the meeting location. It was at this point that I almost quit the run before ever starting it. I was now running late and not even sure if I would arrive in time to catch the carpool to the starting area. As ridiculous as it sounds, I actually thought to myself, “Well, at least I tried” and seriously was on the verge of just driving back home and going back to bed. I hurriedly gave it another effort to start the race and catch the shuttle. I arrived just before the 5 minute warning for departure was being announced. I quickly grabbed my stuff and was the last one to hop in the van. Shortly after the van ride to the start, the run was underway and we were off on the trail. It was still dark and pretty chilly, but calm so the temperature wasn’t as bad as I had expected it to be. I had hoped that once I started running all the negative thoughts I had leading up to the run would fade away quickly as my sole focus on covering the distance took over. This began to happen early as my feet crunched noisily through the heavy layer of leaf debris. It wasn’t long until the first of two early mishaps occurred. The first being the fact that my Garmin watch wasn’t able to locate satellites at the start. No big deal, I would just start recording when it did pick up satellites. When it did, I hit the button and nothing. It was a minor annoyance, but one more thing that wasn’t going how I wanted it to. I messed with it for longer than I would like to admit, but to no avail. Eventually, it beeped and the bezel became locked. At that point I said heck with it, I’m just going to run. It was also somewhere around that point that the few other runners I was with realized that none of us had seen a trail blaze in a while. We went a bit further and concluded that we were definitely off course. We decided to turn around and retrace our steps about a mile before finding the missed turn that we had all run by. I don’t know if it’s “ha-ha” funny or “strange” funny, but if we had stayed on our inadvertent detour about another 100 yards from where we turned around we would have run right back into the trail. Regardless, we got a couple bonus miles in early. Things started going smoothly after that. I used the mile markers along the trail to have an idea of how far I’d traveled and how far I had to go. I used my watch to have an idea of what kind of pace I was keeping and an approximate idea of how long between aid stations. I started to get into a groove as the miles and hours went by. It wasn’t until around the 30 mile mark that I had my last and final mishap. I was beginning to feel a bit tired and worn out at that point. I’d run pretty much solo all day so I decided I’d put my earbuds in for some music and maybe a little bit of an energy and mood booster. It turned out that there was a short in one of the wires causing the music to go in and out. It made the music more annoying than anything else. I messed with the wire for a little bit hoping I could situate it just right so it would stay on when it finally hit me. I had an epiphany of sorts at that point when I realized that all of the hardships I had experienced leading up to this point before and during the run were either self inflicted or intensified and blown out of proportion by my reaction to them. For example, my Garmin giving me trouble should have been a minor distraction that I accepted and moved on from, but I exasperated it by continuing to try to get it to work and giving it more attention than it really deserved. In turn, that reaction may have caused the entire missed turn and early detour mishap due to me being distracted from watching for trail blazes. This is just one example of how an overreaction to one minor mishap can spitball and cause additional problems to crop up if you allow it to. For better or for worse, and I would argue for better, I decided to run a race that I had convinced myself I was not prepared for rather than take a DNS. Although it may not sound like it from this writing, I argue that running this race was an overall positive experience because of the strong lesson I was already aware of but had fiercely reinforced upon me. That lesson being how great of an effect and impact your mental outlook can have on how a run turns out. In a broader view, it’s not just a lesson in ultrarunning, but life in general. Often problems are only as big as we make them. Probably even more often, our reaction to problems causes them to intensify or cause other hardships. If a set of headphones not working ruins your race or your day in general it’s not the fault of your headphones, but your reaction to that problem. Many of the hardships faced while running an ultra and in life in general only have the power of impact that you allow them to have.